Used as a prayerbook as well as a book of hymns for church services, the psalter in the later middle ages was often produced with a calendar and additional prayers. Eventually it was combined with an abridged version of the breviary, the prayerbook used by monks, to form the special lay prayerbook, the book of hours. 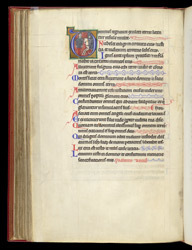 This psalter represents an important stage in this development as it took place in England. It is one of the earliest psalters to include the Hours of the Virgin, a special set of devotions taken from the breviary. Also it is the earliest of a line of richly decorated psalters which were probably made at Oxford, in the workshops by lay scribes and artists, an industry which grew out of book production for the university. Each psalm in this book begins with a historiated initial, decorated with gold and figures painted in rich colours. Psalm 96 (97) ("The lord reigns") begins with a historiated initial showing a knight charging forward on horseback, impaling a soldier on his spear. Many of the smaller decorated initials present subject matter which has only a tenuous relationship with the psalm. Possibly this picture is a response to verses about defeat of foes.